According to eMarketer, nearly 97% of young millennials own a mobile phone, and 91% of those individuals will use it to go online at least once per month. It's clear that millennials and mobile device usage go squarely hand in hand, as 87% of millennials say that their mobile device never leaves their side. When it comes to beauty and personal care, we wanted to understand how mobile is impacting product shopping both online and in-store, so as part of the POPSUGAR Insights study "Beauty Evolved: How Millennial Women Shop for Beauty and Personal Care," we asked women to tell us what their mobile phone means to them. While 60% of millennials say that they primarily use their desktop when shopping online for beauty and personal care products, 35% say that they have fully migrated to mobile for their shopping journey. Millennial women are 49% more likely than women ages 35-49 to primarily use a smartphone or tablet device to shop for beauty and 90% more likely to primarily use their smartphone. When shopping in a physical store, 14% of millennial women say that they use their smartphone every time they are shopping for beauty or personal care products. Millennials are 32% more likely to always use their smartphones when compared to women ages 35-49. Over half (55%) of millennial women say they use their smartphone often or sometimes when in a physical store, as compared to only 39% of women ages 35-49. 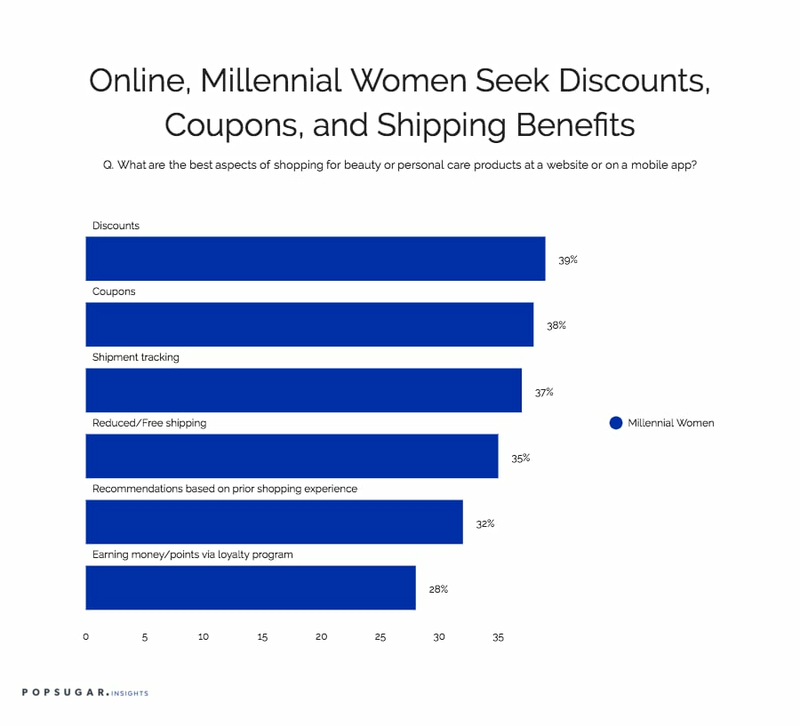 While in a store shopping for beauty products, millennial women are using their smartphones and mobile devices to find coupons (38%) or a better price (33%), research product reviews (32%), or obtain detailed product info (22%). Over one in five millennial women are using their phone to take a photo of the product they are looking at for future consideration (22%), and 18% are taking a photo of the product to send to their friends to obtain their opinion.